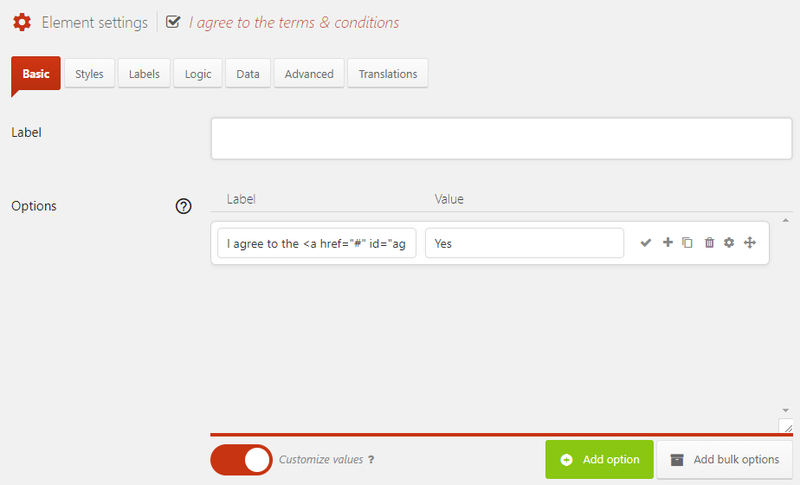 Add a Checkbox element to the form, then go to the Settings for it and make the following changes. The settings should look like the image below when you are finished. Add an HTML element to the form, then go to the Settings for it. For the HTML setting add the following code. Paste the HTML for the terms and conditions here. Then go to the Advanced tab and copy or remember the unique ID for the HTML element (e.g. 1_4). When using Magnific Popup you might need to add extra CSS to style the popup content. Add the CSS code below to the Custom CSS (All devices) field and adjust it to suit.